Reliance Jio 5G ecosystem will be made available in India only by end of 2019, or early 2020. The second day of India Mobile Congress (IMC) 2018 was more demonstration-centric, hence the day was more interactive. 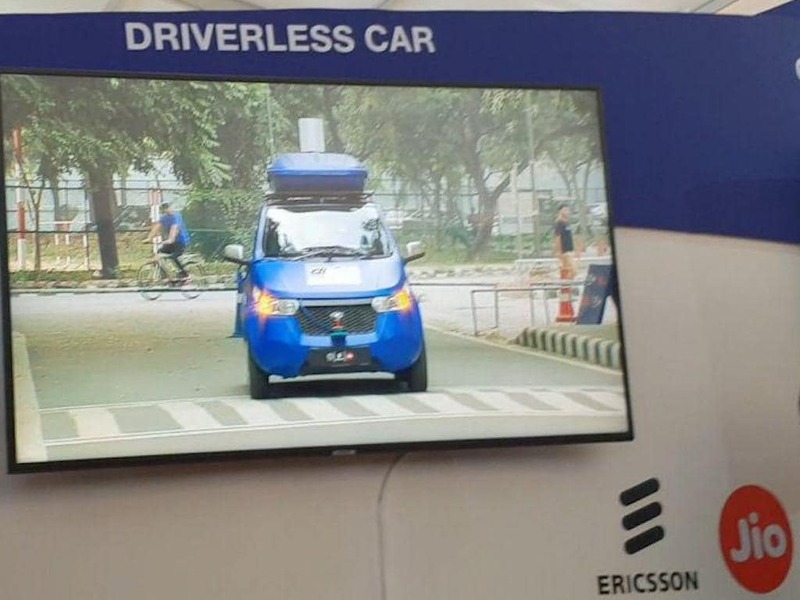 One of the most interesting bits of the event was the use-case demo by Reliance Jio and Ericsson, to show off 5G’s contribution to autonomous vehicle technology. Essentially, the use-case demo was divided between two places. One, at the Aerocity venue, where there was a simulator setup, which had a screen that was displaying the visuals from the camera that was attached to a driverless car in IIT Delhi. That’s about 10 km apart. What we saw was a person in Aerocity, controlling the driverless car in IIT Delhi, via the video being streamed from there through 5G. Basically, this demonstrates the low latency and efficiency of 5G that has the potential to seamlessly connect you in real time, regardless of the distance. There was another demonstration which was streamed live from the Jio city in Navi Mumbai, which showed a bus, with all its glasses cover in dark black sheets so you can’t see anything through it, with the way ahead of the bus live streamed to the driver via virtual reality headsets. These are very simple use cases of the technology, however, if everything goes as planned, this kind of connectivity, could be great in remotely handling cases. For instance, doctors could attend to patients and perform robotic surgery without geography being a handicap. At this point, you are likely to ask, if and when this will become reality. We asked Jio and Ericsson representatives the same question. We were told, that the Jio 5G ecosystem, which is basically consists of chipsets, devices and peripherals that are compatible with 5G, will be available by end of 2019, or early 2020. However, affordable 5G products will be available only by 2021. Having said that, Ericsson says that most 4G products can pretty much be used for 5G tech as well, so in a way, the company is already manufacturing 5G-compatible devices at its factory in Pune, India.